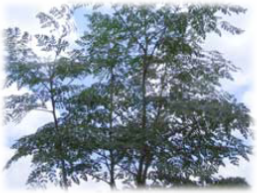 Moringa is an amazing tree with leaves packed with nutrients - vits A&C, protein, calcium. 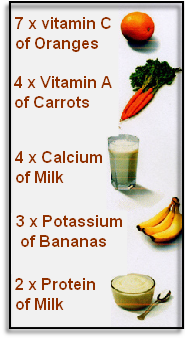 potassium and iron. It’s fast growing and drought resistant when established. 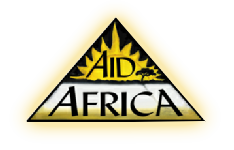 Enthusiastic anecdotal reports from our AIDS support group claim that side effects, common with ARV treatment, (particularly skin rashes and joint pain) have greatly reduced since taking it. The babies enjoying the phala are also gaining weight and looking much healthier. 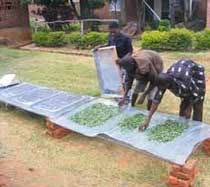 After washing and sterilising, the leaves must be dried out of the sun to protect nutritional value. 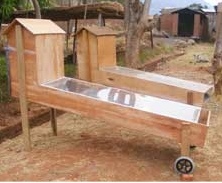 We use mesh frames (above left) covered with tin “hats”, or purpose built dehydrators, (right) powered by natural solar. Around us are hundreds of malnourished people, of all ages, and this tree could well change the face of our part of Malawi - if we can just convince communities of its value! We’ve given over most of our two sites to it’s growth, planting it in double lines, pruning to about 1m high to enable easy access to the leaves for harvesting. 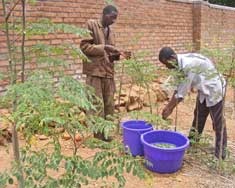 So our aim is to encourage everybody in the area to grow this tree, and we provide seeds and seedlings through our reforestation programme. 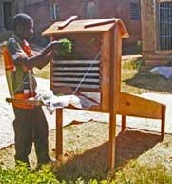 We’re also sending out a “moringa training team” into the communities to demonstrate how to plant & care for the trees, learn about nutrition, and practical taster sessions showing how to cook without losing nutrients. be eaten raw in a salad, or dried & ground into a highly nutritious food supplement for the frail. We add the powder to our likuni phala (fortified porridge) for youngsters in the remote areas, and give it to the elderly & AIDS-affected. 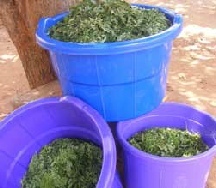 The dried leaves are ground in our Processing Unit and stored in opaque, air-tight containers away from light & moisture.